Projects include ‘Baskets of the British Isles’, an installation of 52 styles of traditional British baskets hanging over the lobby bar of the Whitby Hotel in Manhattan, the ‘Our House’ project at Selfridges, and a unique class in pigeon basket making for the University of Hertfordshire’s Basketry ‘Then and Now’ project, which looked at the role of basketry in World War One. Maker of the Year was one of six awards presented at the Heritage Crafts Association’s (HCA) annual conference, Crafts for the Future, at the Royal Society of Medicine on 24 March. Green woodworker Steve Tomlin won the HCA/Marsh Endangered Craft Award. 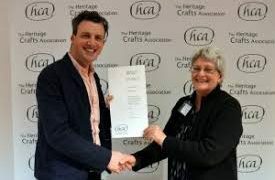 This new award, set up with the support of the Marsh Christian Trust, recognises a practitioner of one of the 62 crafts currently listed in the ‘critically endangered’ or ‘endangered’ categories of the HCA Red List of Endangered Crafts. Steve, a spoon carver, ash basket maker and scything tutor will use his award to learn to make Devon stave baskets (maunds), a critically endangered craft with no current practitioners or trainees. HCA/Marsh Trainer of the Year is bookbinder Kathy Abbott. Kathy currently teaches advanced level Fine-Binding in Vellum at City Lit in London as well as giving one-to-one fine-binding workshops across the UK. The Marsh Volunteer of the Year Award went to Suzy Bennett for her work creating the Dartmoor Artisan Trail. Suzy set up the trail to provide rural craft businesses with a new income from tourism, spending 18 months working on the project on a voluntary basis. The trail was named by the Daily Telegraph as one of the UK’s best travel experiences of 2017. Paper maker Zoe Collis won The Arts Society/HCA Heritage Crafts bursary which she will use to continue her training at Two Rivers Paper in Somerset. Zoe, a former participant in the HCA’s pre-apprenticeship project funded by the Ernest Cook Trust, was one of only a few successful applicants on the national paper making Trailblazer apprenticeship scheme. She will use the bursary to help pay for the costs of her qualification, which is only part-funded by the government. During the conference, vellum maker Wim Visscher MBE, rush worker Felicity Irons BEM and flint knapper John Lord BEM were awarded with certificates to mark their inclusion in The Queen’s Birthday Honours Lists in 2017. All three were nominated for their awards by the Heritage Crafts Association. Speakers at the conference included ceramics producer Emma Bridgewater, TV presenter Paul Martin, and Sam Walton, creative director of Hole and Corner magazine. The event, which focused this year on the future of heritage crafts, brought together craftspeople and enthusiasts from all over the UK to hear from makers and celebrate the best in the country. The Heritage Crafts Awards celebrate and highlight the traditional living crafts made in the UK that contribute to our national heritage. Applications for the next round of awards and bursaries open on 1 September. For more details about this year’s awards, visit awards.heritagecrafts.org.uk.